With goals, managers can create user-specific quotas for their sales and services teams. Managers can then assign these goals at the user, team, or pipeline level. Please note: goals will replace quotas in paid Sales Hub and Service Hub accounts created after September 5, 2018. Free users who created a quota in the quota tool before September 5, 2018 will still have access to a basic version of goals in their account. With this basic version, users are still able to set fixed, monthly revenue goals. In the left sidebar menu, navigate to Reports > Goals. In the Add goal pane, click the Type of goal dropdown menu and select Sales or Services. Please note: you must be a Super Admin in order to create goals in your account. In order to be assigned a goal, however, you must have have either a paid Sales Hub Starter, Professional, or Enterprise seat, or a Service Hub Enterprise seat. Sales Hub Starter and Professional users - Revenue. Please note: you can assign Sales Hub Starter and Professional users a fixed, monthly revenue goal only. Sales Hub Enterprise users - Calls logged, Meetings booked, Revenue, Deals created. Service Hub Enterprise users - Average ticket resolution time, Average ticket response time, Tickets closed. Use the search bar to search for a user in your account. Select the box next to their username(s). In the appropriate Month column to the right of a team member's name, click Create goal. 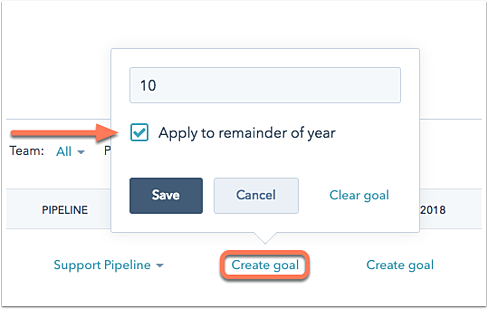 Enter a goal value, then select the Apply to remainder of year box if you want your team member to have the same goal for the entire year. If you do not choose to apply the goal to the remainder of the year, you will need to manually add a goal for each month. Please note: if you are a Sales Hub Starter or Professional user, you can only be assigned a fixed, monthly revenue goal. On the goals dashboard, view your goals by measurement type, team, and pipeline. 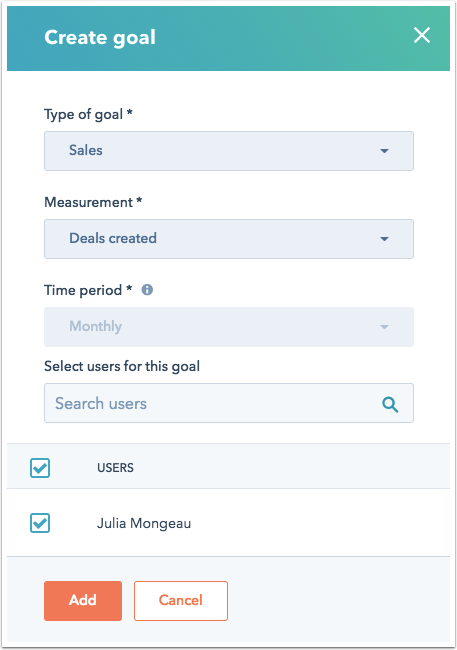 Click the dropdown menu above the list of users to filter by a goal measurement. Click the Team dropdown menu to filter your users by team. If you are tracking revenue, click the Pipeline dropdown menu to view goals for a specific pipeline. Edit the goal value at anytime by clicking the current goal value. Enter a new value or select Clear goal. If you want to remove a user from your goals dashboard, select the checkbox to the left of their name, then click Delete delete.